Visit the delightful seaside town of Sandpoint on festival day. Participate in fair games and join the crowd to delight in the mayor's long winded speeches. That is until the Goblins attack. 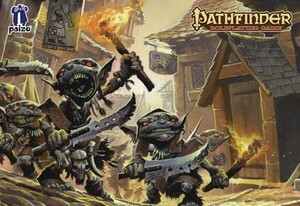 The "Attack on Sandpoint" features the iconic Paizo Goblins wreaking unrestricted havoc, with dog-slicer, fire and bomb. You can also hear the famous Goblin Song, sung with the appalling inaccuracy that only Paizo Goblins can muster. This SoundSet contains all the music and atmosphere you need to run the opening encounters of "Burnt Offerings", the first chapter of the wildly popular "Rise of the RuneLords" adventure path. Pathfinder Adventure Path: Rise of the Runelords Anniversary Edition, Burnt Offerings © 2012. Paizo Inc., the Paizo golem logo, Pathfinder, and Pathfinder Adventure Path are trademarks of Paizo Inc. Author: James Jacobs. SoundSet © 2014. Sounds created under license with Paizo Inc.